Jim's Photos started photographing water skiing back in 2004. There are many water ski show teams throughout the world but it seems there is a large concentration of them in Wisconsin. Throughout the warmer months, these groups practice almost every day to prefect their acts and put on shows for all to enjoy. Most teams do weekly home shows for the local folks. Several times per year, there are show ski tournaments that are held. There are local tournaments as well as State, National and World tournaments too. Be sure to use the links below for see photos from some of the local teams in southern Wisconsin. All photos can be printed in any any size and style. Each event has 2 galleries both containing identical images. One gallery is for ordering prints and the other, marked with a [d] is for digital downloads. Additionally, I can order larger posters of any size for you as well. The 18"x12" posters are a great value for only $12.00. Contact me for details! All events are photographed by Jim's Photos, LLC unless noted. Select the event you are interested in below. This schedule is tentative and subject to change. Photos are subject to availability. Prints are for sale. All events are photographed by Jim's Photos, LLC unless otherwise noted. Select the event you are interested in below. I have photos for all the events listed here. I try to capture as many games and events as I can, however they don't always get posted right away. If you would like a specific event posted, click on the icon next to the event you are interested in. I will try to give that event priority. Note: Events with an * (astrek) are partial posting with more to come. More photos will be posted on request. USA Water Ski announced the running order for the 2015 Division 1 Show Ski National Championships that took place at Shorewood Park in Loves Park, IL from August 7th through the 9th, 2015. For all the details on the running order for the weekend, please see the official schedule from USA Water Ski available here: Nationals 2015 D1 Running Order. See 2015 Nationals details here. Here are some results here. Aquanut Water Shows Inc., Twin Lakes, Wis. won the national team title at the 41st Indmar Marine Engines Division 1 Show Ski National Championships, presented by Polk County Tourism and Sports Marketing, Aug. 7-9, on the Rock River at Shorewood Park. The Aquanuts tallied 1,967.2 points in winning its first national title since 1984. The Aquanuts, which won three consecutive national titles between 1982 and 1984, earned top-scoring awards for ballet, barefoot and star swivel. 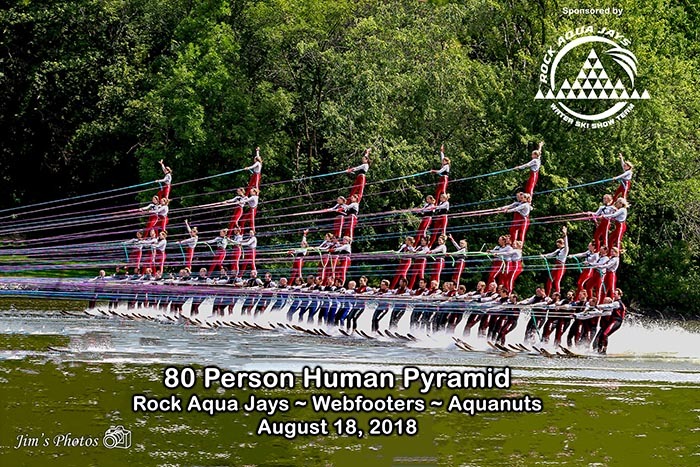 The Rock Aqua Jays Water Ski Show Team, Janesville, Wis., seeking its fifth consecutive national team title, placed runner-up with 1,958.78 points and earned top-scoring awards for showmanship, overall show, pyramid, star doubles, dock & equipment crew, pick-up boat, towboat driving and sound crew. The Mad-City Ski Team, Madison, Wis., winner of the 2015 Wisconsin State Show Ski Championships last month, scored 1,899.1 points to place third, followed by the Muskego Water Bugs, Muskego, Wis. with 1,726.02 points and the Wonder Lake Water Ski Show Team, Wonder Lake, Ill. with 1,714.12 points. Teams competed at the 2015 Wisconsin State Water Ski Tournament on July 16 - 19, 2015. See the tournament details here. See all the 2015 tournament results here. See the 2015 Individual running order here. See the 2015 Team running order here. The location was at South Wood County Park - Wisconsin Rapids, WI on beautiful Lake Wazeecha. Listed below are photos from the 2014 Water Ski season. USA Water Ski announced the running order for the 2014 Division 1 Show Ski National Championships that took place at Traxler Park, Janesville, WI from August 8th through the 10th. For all the details on the running order for the weekend, please see the official schedule from USA Water Ski available here: Nationals 2014 D1 Running Order. See Nationals details here. See the Nationals results here. Teams competed at the 2014 Wisconsin State Water Ski Tournament on July 17 - 20, 2014. Also, see the 2014 Individual and Team running orders. The location was South Wood County Park - Wisconsin Rapids, WI on beautiful Lake Wazeecha. The Mercury Marine Open tournanemt took place on June 21, 2014 at Traxler Park on the Rock River in Janesville, WI. USA Water Ski announced the running order for the 2013 Division 1 Show Ski National Championships took place at Shorewood Park, Loves Park, IL (near Rockford, IL) from August 9th through the 11th. Congratulations to the Rock Aqua Jays who took 1st place at 2013 D1 Nationals. Mad-City followed by taking 2nd place. The Beaverland Must-Skis Ski Team skied 4th on Saturday, August 10th. Congratulations to the Must-Skis who took 8th place in the nation at the 2013 D1 Nationals. Must-Skis team members Riane Wilkie & Josh Schulz competed in the Doubles Competition and Chad Weisensel in Freestyle Jump on Friday, August 9th. Congratulations to Josh and Diane for their 12th place win and to Chad who took 4th place in the nation. See all scores and complete results here. Nationals 2013 D1 Running Order. Teams competed at the 2013 Wisconsin State Water Ski Tournament on July 18 - 21, 2013. Congratulations to the Rock Aqua Jays who took 1st place! and the Must-Skis who took 3rd place! Here are the complete tournament results. Also, see the Individual and Team line-ups. The location was South Wood County Park - Wisconsin Rapids, WI on beautiful Lake Wazeecha. Beaverland Must-Skis participates in the 2012 "Big Pull" world record 54 person pyramid. Jim's Photos is able to print any photo for you. Throughout this website, there are thousands of photos posted. Use the link below to see my photo ordering system used for viewing photos and ordering prints and other neat stuff. You will be taken to the thumbnail indexes for thousands of photos. Click on the thumbnail to view a larger version of the photo you are interested in. Use the "Buy" button to purchase the photos. You will be given many options to choose from. All photos are high resolution suitable for printing and framing. Large poster prints are available for most images. High quality Prints as well as individual high resolution digital image downloads are available. If you have a discount coupon code, use that during the checkout process. See how to order photos. All events are photographed by Jim's Photos, LLC unless noted. Select the event you are interested. All schedules are tentative and subject to change. Photos are subject to availability. Prints are for sale. Note: Jim's Photos is not affiliated with any school, team, group, club or organization and receives no compensation from them. Photo orders are appreciated! The photos in our galleries are original in size and resolution. You can crop and fit the image to the print size you prefer. After choosing your photos, place them in your shopping cart. There is a cropping tool for you to use. Click on the Adjust button. Drag the corner handles to crop or adjust for best fit. If you require special photo editing, please e-mail us with your request or call 608-663-3500. We try to capture as many games and events as we can and we have photos for all events that are listed, however we don't always get them all posted right away. If you would like a specific event posted, click on the icon next to the event you are interested in. We will try to give that event priority. Jim's Photos can make available to you a bulk 'Digital Download' option for any event listed on my site. The bulk Digital Download option would be available for all photos from a specific event and available to everyone who views that event. There will be a ‘Download Image’ button next to the photos of interest. Additionally, any event can be password protected. This way, interested persons can download photos and make any number of prints on their own. With the bulk Digital Download option, any interested persons can make unlimited prints on their own. There is a one time fee that buys the bulk Digital Download option for everyone who accesses that event. Normal print options will still be available and any applicable team or club discount will be available as well. The bulk Digital Download pricing varies considerably depending on the number of image downloads available. Please inquire about pricing. Jim's Photos is able to print any photo for you. Throughout this website, there are sub-sections featuring portraits and the many events I cover. You will find thousands of photos posted. Click on the links for the photos, events, or shows you are interested in. You will be taken to my photo viewing and ordering web site. Here you can browse the thumbnail indexes of photos. Click on the thumbnail to view a larger version of the photo. Use the "Buy" button to purchase the photos you are interested in. You will be given many options to choose from. Jim's Photos is proud to offer photos of Water Ski shows and tournaments. I try to capture as many shows and events as I can and I have photos for all events that are listed, however I don't always get them all posted right away. If you would like a specific event posted, click the (Coming Soon) icon next to the event you are interested in. I will try to give that event priority. *All photos on this web site have been reduced for web site viewing. Actual prints are full photographic quality. All are high resolution photos that are suitable for printing and framing which can be ordered by following the instructions above. Large poster prints are available for most images. Any information appearing on the photo (watermarks) will not be present on your prints. Note: Jim's Photos, LLC is not affiliated with any team, group, club or organization and receives no compensation from them for his work. Photo orders are appreciated! All photographs and content of website contained herein are the exclusive property of Jim's Photos, LLC and may not be used or reproduced in any manner without permission. 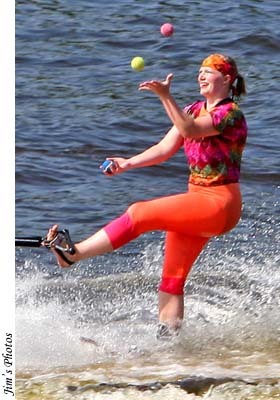 This web site section is dedicated to the Water Ski Show Teams. It illustrates their beauty, talent and achievements though photos. It is our hope that you will enjoy the photography and help support this team of wonderful dedicated people. Special Introductory Offer: For a limited time, you can get 1 "Individual Portrait" photo done for free! No session fee, no strings attached. Please e-mail me for details and to schedule a time that is convenient for you. So whatever kind of photography you are interested in, whether it be Portraits, Sports, School, Concerts, Weddings, Graduations, Birthdays, Family Groups or Events, Modeling, Holiday, Real Estate, Construction Work, Trains / Boats, Industrial / Commercial, Advertising, Outdoor, Indoor, or just about anything you want, I can do it all! Download Jim's Photos "Photo Release Form" here. | Download Adobe Reader here.